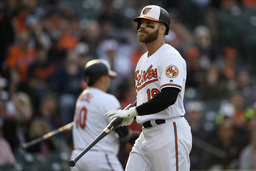 BALTIMORE (AP) Hitting the ball sharply and getting good distance on his outs now counts as progress for struggling Chris Davis, whose futility at the plate has earned him another dubious major league record. The 33-year-old has two RBIs this season - on a bases-loaded walk and a forceout - and has struck out 15 times. Jonathan Villar homered and had four RBIs, Trey Mancini went 3 for 3 with a homer, Cedric Mullins hit two triples and drove in three runs and rookie shortstop Richie Martin's first multiple-hit game included a triple and a pair of singles. Mullins scored on a Little League homer after a throwing error from second baseman Jurickson Profar in the second. Profar made two errors - one fielding, and one throwing - at second, where he's been used primarily since signing with the A's during the offseason.